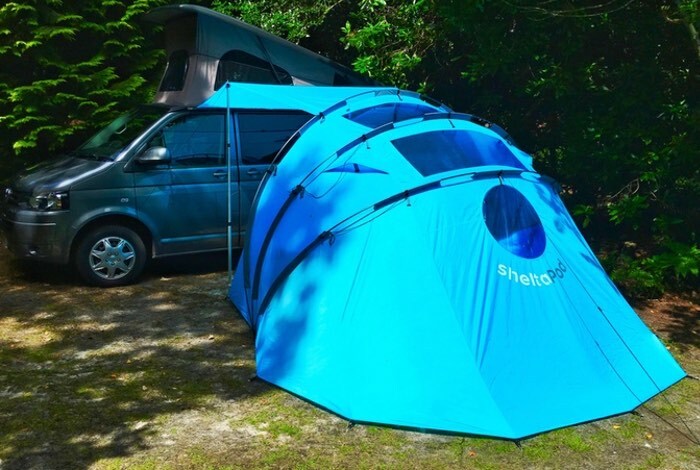 A new modular campervan awning has been created by Julie Ritson called sheltaPod, which can be easily modified to adapt to any type of weather, thanks to its flexible design. Watch the video below to learn more about the innovative sheltaPod campervan awning, which has taken to Kickstarter to raise the £80,000 it requires to make the jump into production. Julie explains more about the inspiration behind the sheltaPod and its modular design, that can adapt to any weather condition, good or bad. It’s unique and stylish design allows for more light and better views from inside the van. sheltaPod is quick and easy to set up, even singlehanded and packs away into a 100 x 25cm bag for easy transportation. Originally designed for smaller camper vans, it will also fit onto other vehicles that have roof rails/racks (i.e. SUV’s, wagons, etc) by using the fitted velcro straps. If you’re camping for just one night the rainfly gives you shelter for dining and storage . If you need extra sleeping space you can clip in the inner tent. This is the perfect accessory if your camping for longer. The Pod section can fold up to a simple canopy. If the sun is shining you can gather up the fabric in each section and clip it to the pole sleeves. Each pole sleeve has several tiebacks and they can be clipped against each other. Also on each side of the door there are windbreaker panels which can be tied back when not needed. If the weather changes it’s easy to extend the canopy and get more cover. Drop down one or two sections and clip in the curtains if needed. For more information on the new sheltaPod jump over to the Kickstarter website for details by following the link below, where pledges are available from just £225 for early bird backers.